With the weather still a little chilly but summer quickly approaching so many of us are having the constant struggle of, wanting warm delicious comfort food and wanting a hot delicious summer body! This is one of my favorite pasta alternatives for when the weather is a little chilly and I want something delicious and easy. 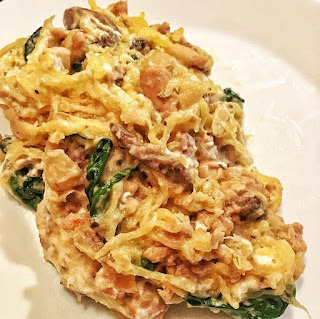 Spaghetti squash is an excellent alternative to pasta, but seriously, let’s all be honest with each other, no, it is not LIKE pasta, it is LIKE spaghetti squash, delicious and mostly carb free. Just like zoodles, while pasta LIKE, they are not pasta, they are vessels for flavor, a way to get the delicious sauce into your belly. Cook your spaghetti squash, I like to cook mine in rings with the seeds removed because it most closely resembles spaghetti. You can cut it into rings, or in half and remove the seeds and drizzle it with olive oil and roast it in the oven at 350 for 40 minutes or until the inside is tender. OR you can cut it in half, scrape the seeds and pop it in the microwave for 12 minutes, EASY PEASY! Use a fork to remove the spaghetti strings from the shell and add them to a large bowl. To remove your turkey sausage from the cashing use a sharp knife to slit the side of the sausage and simple peal the casing away, or squeeze the meat out of an end of the sausage. This may be a touch messy but it is a good way to have the kids help if you have them! Cook until the sausage is brown and fully cooked, remove from the pan and put the pan back on the burner. To the same pan add olive oil, and the sausage removed from the casing. Use wooden spoon to crumble the sausage and cook until fully cooked, add onions and begin to sauté, when they begin to get translucent add the garlic and if you want the pinch of crushed red pepper flakes. Sautee for two minutes on medium heat. Add the mushrooms, cook for two more minutes, add the drained beans to the pan and stir to incorporate. Add the sausage crumbles back into the pan and add the spinach, stir and season with salt and pepper. Pour the sauce over the spaghetti squash and add the goat cheese, stir to incorporate while still hot, the cheese will begin to melt and coat the squash to form a sauce. You can put the same sauce over regular pasta, add a few spoonsfuls of the hot pasta water to create a silky sauce over your pasta!